Peaches caught in the act of eating her poop, with one front paw firmly planted on the fleece to maintain her balance and the other raised for easier access. 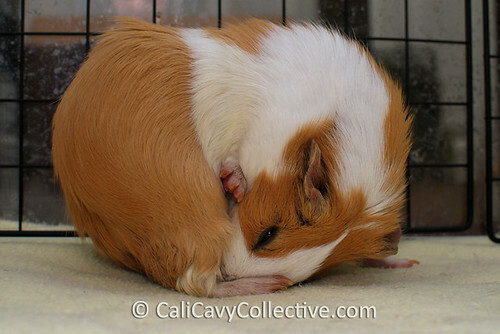 Coprophagy is an essential part of the guinea pigs digestive process as it allows them to maximize the nutrients they can derive from their diet. It looks like she had an easier time reaching for it when she was younger. One year and several ounces later seems to have made it more of a workout.